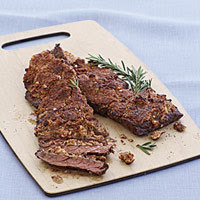 Pecans give the steak a crunchy, toasty crust in this quick main course. Serve it with coleslaw, or steamed broccoli served with a few lemon wedges on the side. Position an oven rack about 6 inches from the broiler and heat the broiler on high. Line a large rimmed baking sheet with foil and grease the foil with the oil. If necessary, cut the steak crosswise into pieces 8 to 10 inches long. Arrange the steak on the baking sheet in a single layer and season with 1 tsp. salt and 1/4 tsp. pepper. Put the pecans, butter, honey, rosemary, 1 teaspoon salt, and 1/4 teaspoon pepper in a food processor and pulse until well combined and the pecans are finely chopped. Broil the steak until lightly browned, 3 to 4 minutes. Flip it and broil until it's cooked nearly to your liking, about 3 minutes more for medium rare. Spread the pecan mixture over the steak, patting the mixture with the back of a spoon to help it adhere. Continue broiling until the pecan coating is toasted and fragrant, 1 to 2 minutes. Set the steak aside to rest for 5 minutes. Thinly slice the steak against the grain and transfer to plates. If the pecan coating falls off the steak as you're slicing it, spoon it over the top. This entry was posted on 10:40 PM and is filed under Beef . You can follow any responses to this entry through the RSS 2.0 feed. You can leave a response, or trackback from your own site.